Why bother to declutter? What is it really going to do for me? How is it going to make my life better? I am sure these are the first questions people ask when they begin on the journey of decluttering and/or minimalism. I know we have discussed this topic many times before but we can always do with a refresher course especially if we have lost momentum. So today I will share with you this chapter from my free ebook as it covers some great benefits of living a decluttered life. A Fresh Start ~ It is never too late to begin a new phase in your life. Cut yourself some slack and do not dwell on the past. Acknowledge the things you got right and learn the lesson of your follies but either way do not dwell on regrets, just enjoy the fresh start you are making. More Space ~ It really does feel good as the clutter starts to disappear and you begin to feel the freedom of empty space growing around you. This feeling can be appreciated from the very first item and increases over time. Take a moment to focus on that freedom with every little piece of clutter you choose to remove and fill the process with joy rather than dread. Less Maintenance ~ It stands to reason that the fewer items cluttering up your home, the easier it is to keep your surroundings clean and tidy. Every item you remove is one less thing you need to maintain in any way whether dusting, cleaning or storing. Also house cleaning will be simpler if there are fewer items to be moved in order to access the surface under them such as benches and floors. And you gotta love that! Guilt Relief ~ We generally carry a burden of guilt for every item associated with the waste of money or lack of use. For every one of these items that leaves our home there is a relief from that guilt so long as we learned the lesson of needless waste. Giving Back ~ Whether we sell items to grateful buyers on eBay, donate items to charity, give items away to friends and family or recycle them, there is a good feeling that accompanies each action. Focus on those good feelings and it will spur you on in your quest. Appreciation ~ You will find that you have a higher appreciation for the items you choose to keep and their role in your household. Being Environmentally Responsible ~ The key to decluttering is not to reclutter. For every unnecessary item you do not purchase, and every item that you give to someone in need, you are doing a small deed to save the environment. For every item that is manufactured there is a cost whether in natural resources or carbon emissions, so the less you contribute to the supply and demand of these products the better hope there is for our planet’s survival. Simplifying -There is more to this topic than the title implies, having an uncluttered home and embracing the principles of staying uncluttered can simplify your life. I have discovered the freedom that clutter reduction has added to my life and that has allowed me to enjoy the present and foresee a better future. Put clean sheets on the spare bed. No I didn’t forget to finish the list, that’s it! The spare room is spotless, the house is spotless, I don’t have to clear anything out of the way and I am ready to take visitors anytime at the drop of a hat. Now if that isn’t a huge benefit of decluttering I don’t know what is. Less Embarrassment ~ Being able to welcome visitors into your home at any given time, without a moments notice and without feeling ashamed about the appearance of you home is a big plus. If you have so much stuff that it can’t be stored away neatly the oposite situation can be a real possibility for you. Not having to prepare my house for quests. A nice sunny day to get the sheets dry on the clothesline. Having the car to run errands with. ~ I finally got that load of stuff to the thrift shop. The friendly staff at my local hardware store. ~ They were extra friendly and extra helpful today and I appreciate that. Reading the book my daughter wrote about me. ~ Here is one of the things she wrote. I’ve never known anyone who is so loved by all of the people in their life. You almost glow with a personality that is impossible to deny. There should be so many more people like you in the world. ~ I don’t know if all that’s true but if she believes it then that is pretty special and I am a very lucky mum. Colleen, your guest bedroom is lovely! What an inviting space! ps. 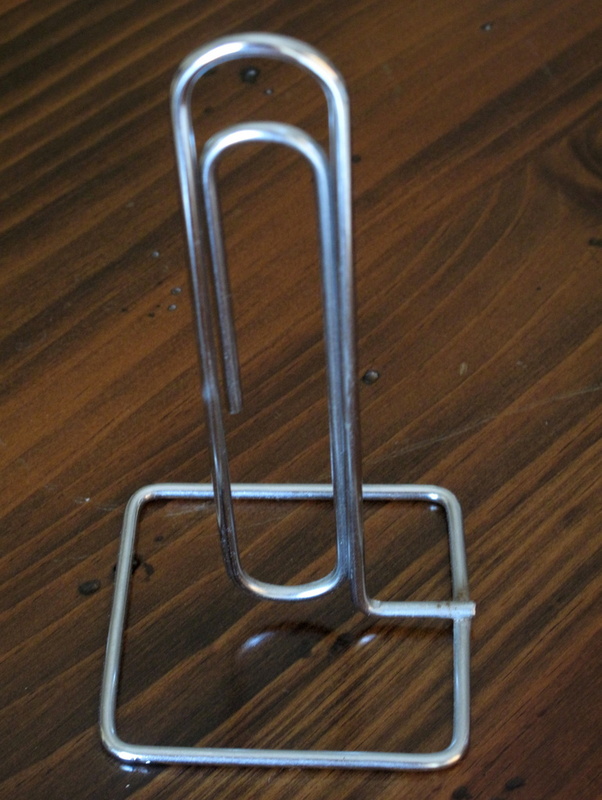 is that decluttered item a REALLY BIG paperclip, or is it close up? I am sure if you explained to them that the pile of stuff was declutter items they would realise that you were not just being messy. 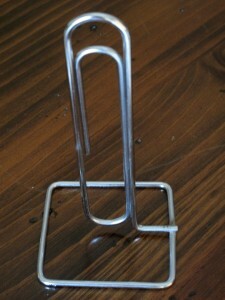 Yes, that is a giant paperclip, about 7 inches tall. Now that I think about it I am not even sure where it came from. I probably belonged to my daughter, who knows, who cares, it’s gone now. Yep to the whole list! In my case, though, the get-ready list would have to include purchasing something to sleep on, as the room has no furniture except a spare dining chair! I do know it will be air mattresses which are the same size as our existing bed linens. And yes, my daughter sure has a way with words. She is great with greeting cards as well. Our house is just like yours–very clutter free and clean. My mother still goes into a tizzy when someone is coming to visit whether for a few minutes or overnight. She thinks people will find fault with her housekeeping. I have had housecleaners ask why we have them come because our house is so clean. Our list should be just like yours but it isn’t. I hope many people will read what you have written and realize that it really isn’t hard to achieve that short list once they have done a good job of decluttering. the freedom decluttering gives is wonderful. the more of the clutter that leaves our house the better it feels. I often wonder when I will finely end up just at the maintenance phase but like I have said a million times, I don’t care as I know I will get there in my own good time. I know! It is such a relief when you don’t have a lot to clean up when people come over. So that’s my room when I make it Australia? I like it! yes that is it. It is a little girly but it is still considered to be Bridget’s room. Mind you there is no guarantee that we will still be in the same place. In fact there are a couple of postings on offer to Washington DC at the moment and my husband has to find a new position as his time is up in his current one at the end of the year. A very good list indeed. My two greatest motivators are less maintenance and less embarrassment. I’m not there yet but I’m on the path. It must be so heart-warming for you to read those comments from your daughter. so long as you are still on the path and heading in the right direction you will get there in you own good time. Bon voyage! My daughter sure can be a sweet little thing. It is nice to know what she really thinks of me. She did a book for her Dad too and it is just a nice. What a great guest room! This post is so motivating to me. Right now there is a mad rush at my house to clean up all of the toys before we have company. We’re slowly decreasing the number of toys around here, but it’s a process. Especially since my oldest son has to be okay with his stuff that makes its way out. Those words your daughter wrote will surely echo in your heart for an eternity. What lovely things to say (and mean) to someone. it is so easy to get carried away with how many toys the kids have and it is not always the parents that indulge them. Grandparents never seem to be able to show up without a gift in hand and then when the kids are big tell us parents we have spoiled them. 😕 Good luck with the toy round-up. Once the kids have the toys it really has to be up to them when they are ready to part with them unless they get too clingy then sometimes Mom has to step in. Great post Colleen. I can relate to much of your list. I think the greatest is the relief and sense of lightening a load from my shoulders. I certainly feel a lot happier now at the thought of unexpected visitors. I can’t believe some of the stuff I have got rid of; stuff that was so ‘not’clutter in my eyes just a few months ago, when I started out and I regret nothing that has gone. Your blog has significantly helped me get as far as I have. Plenty more work to go though, but I am sure my attitide to what I will allow into my home in the future has changed. good for you and I am glad my blog has been helpful to you. I am constantly amazed at some of the things that pass through to the donation bin. In some cases amazed at the fact that we are letting go so easily now and in others that we had clung on to the stuff for so long. I think it helps to know the avenues to how we can pass them on to others. Knowing that even obscure items are of value to someone else and knowing that sites like Freecycle are out there to help find new homes for it makes parting with it without the guilt so much easier. I love the words your daughter wrote about you….. thanks for the post and for sharing the things that make your happy every day… Saludos! she is a precious girl. It is good to focus on the good things that happen in a day because sometimes it is too easy to focus on the bad stuff. Beautiful guest room. I’m tossing up whether to look for a new house with an extra bedroom to make up like that, or just to have a fold-out couch in a small study-type room. It would be nice to to have to scramble around before people come,and have everything laid out beautifully. Thanks for this post. I was starting to panic a bit, listening to a group of mums at school talking about how they CANNOT get rid of things made me feel like a bit of a freak. It’s wonderful having this on-line community who understand that people are more important than things. Don’t listen to people who CANNOT get rid of stuff Loretta; that’s why you’re here, among (decluttering) friends. As for my daughter, it is heart warming to read her book. I just wish I could get her to clean her room. Pretty guest room, love the pink! Ours is very easy to keep ready for guests as well, as there is just the bed and sidetables. Mind you, it would have to be dusted before I could let anyone in there, but that’s all that would be required. It is a nice feeling for sure! Beautiful words from your daughter too! thank you, for both your comment about my lovely guest room and my beautiful daughter. I am glad that just a little dusting is all it takes for you to receive guests as well. Good for you! Your spare bedroom looks lovely. Mine just has space for a bed, one side table and lamp and two quilted wall hangings, oh and curtains. Always ready, what a great feeling. As you know, you inspired me last year to get going again. Today I hit 365 less things! I started on 25 March 2010 and today just over a year later I got there. I did it on 63 days instead of one thing every day, I find it easier to get a bit of momentum going. Although I consider myself fairly clutter free, there is ALWAYS more I can do, and the joyful, light feeling is just fantastic. 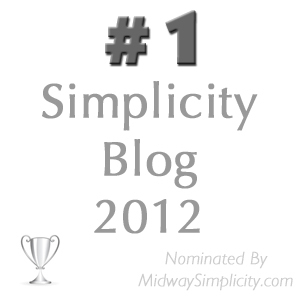 Your blog is at the top of my Favourites list and I check it every day, thanks once again for your hard work. congratulation on your 365 less things. Hooray for you! And also may I say thank you for being with me almost from the very start. You were the forth person ever to comment here at 365lessthings way back on day 92 and I appreciate you support for all this time. I am glad my blog has made a positive difference to your life and you are enjoying the results. Well done and thank you again. Hi Colleen! Your daughter wrote lovely words, and that means you did an excellent job raising her! 😉 Your post just inspired me to go to my pantry. It’s not a big one, for I don’t buy a lot of processed food, but it was FULL of expired food! I kept putting cleaning it off for months, and when I finally get to it, I got sad with all that waste. Lesson learned. Don’t buy stuff on a whim, and when we get gifted at the end of the year give away imediatily what we are not going to consume. Loved your guest room. It’s always nice to have company when you don’t have to tear like mad through the house getting everything from the floor and stuffing it in closets, and PRAYING nobody will open any closets, or go to your bedroom. it is easy to be tempted to buy things at the grocery store thinking a change would be interesting and then never get around to using the new product. I have done that plenty fo times. My own blog has taught me to be more mindful even when grocery shopping. That is not to say that I don’t try new foods I just make sure I use them as soon as I buy them so the waste doesn’t occur. I also know what sort of ingredients I do use a lot and try new recipes that also use those ingredients. At least then I know that if I don’t like the new dish the ingredients will still get used. “PRAYING nobody will open any closets, or go to your bedroom” that is too funny. What a great feeling not to be weighed down by STUFF! I am in the process of decluttering and realizing how much time and energy useless items take up if they are in the way. I have a pile waiting to be sold/donated now, and can’t wait to get it out! Okay what is that declutter item LOL! It’s always so amusing when I can’t even identify an object. 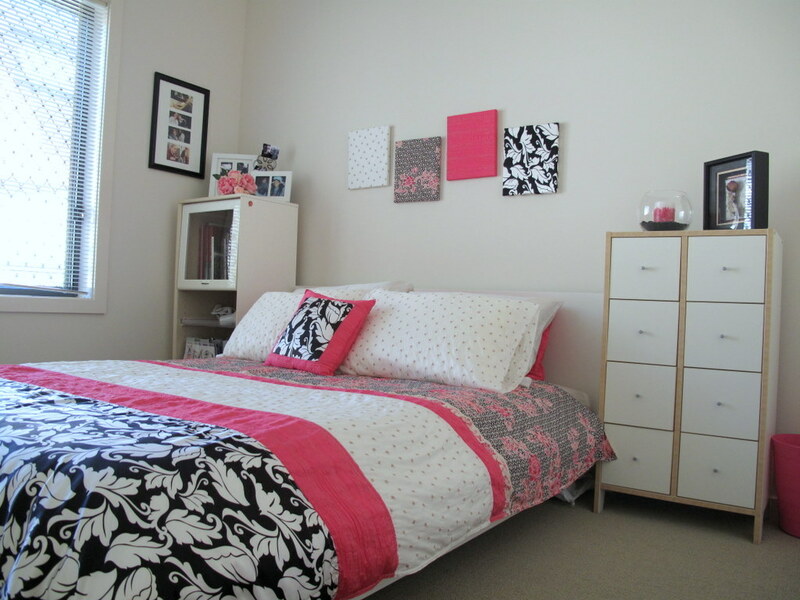 Nice to see a bit of your house, the guest room looks to be in perfect order!!! Anyway, I can testify to the truthfulness of these statements.. I enjoy and appreciate all my things I have CHOSEN to keep in my life. I feel light, peaceful and my home is always five minutes from neat and tidy. And what started out just as wanting to get back in control of my home, spread out all over my life, and I found myself simplifying everything else too, from refraining from shopping, to re-aligning my priorities and aligning my actions with my principles.. and finding out I don’t even want things I thought I did. It may start with things but one might be surprised to find themselves changing as the home empties.. I discovered your site on Tuesday and Thursday a huge decluttering motivator came my way. A dear friend who has five children has to be out of his house by May 1 and needs boxes. I have lots of good moving boxes in my basement, but they are filled with stuff. Time for me to go through the stuff and bag it up for The Salvation Army and deliver him the empty boxes. Thanks for being my answer to prayer. Hi MargeE and welcome to 365lessthings.com it is a pleasure to have you join us. I hope you will stop by often and share your stories with us. I love that you are inspired to declutter all the stuff in those boxes to help out your friend. Wow, five children he really could use as much help as he can get with moving. My mother- and father- in-law visited this past weekend on their way north from their winter home in the south. A little dusting in the guest bedroom, setting up a folding table and chairs to dine on, and doing my regular household chores was the extent of my preparations. The most difficult thing was planning my menu for the weekend since we are vegetarians and they’re not Oh the benefits of being tidy and decluttered! Good for you Di. It is a lot less stressful. My biggest challenge during their visit has been keeping up with my blog and answering the comments. I hope it hasn’t been too obvious.